Today in Saintly Sixteen action, Esther squares off against Michael the Archangel. To make it this far, Esther made it past Lazarus while Michael got by Anna the Prophet. 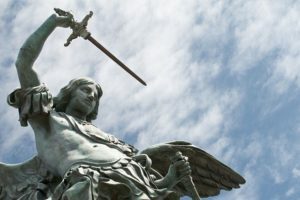 Will St. Michael or one of the “all angels” prevail? Yesterday, Anna Alexander made it past Edith Cavell 65% to 35% to advance to the Elate Eight. She’ll face the winner of Eglantyne Jebb vs. Catherine Winkworth. By the way, our Bracket Czar Adam Thomas delved into bracket history and has ruled that Monday’s battle that saw Maria Skobtsova trounce Quiteria 91% to 9% was the most lopsided victory ever in the modern era of Lent Madness. The previous record was from 2014 when Basil defeated Antony of Egypt 87% to 13%. Oh, and did you miss the Tuesday edition of Monday Madness? If you can stand the planets being out of alignment, watch it here. 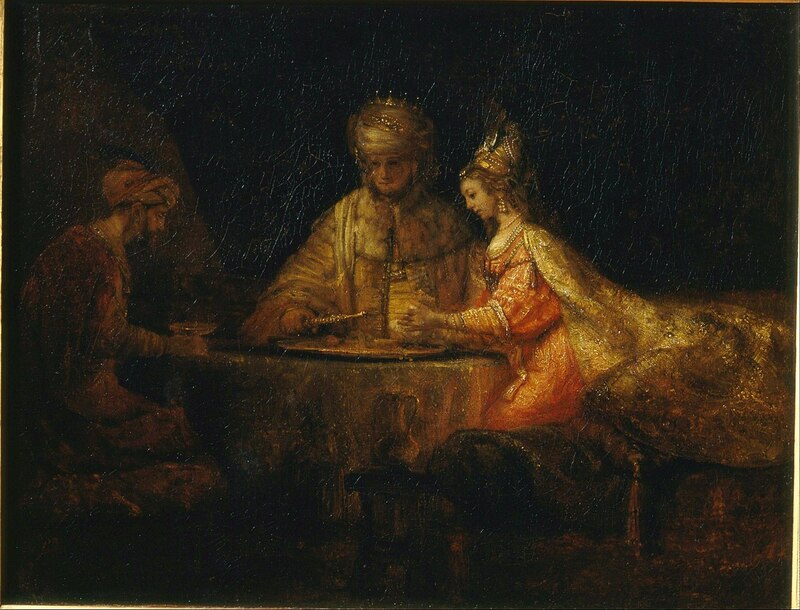 Esther, or Hadassah in Hebrew, was the secretly-Jewish queen of Persia who saved her people from genocide through her prayer, bravery, and wits, as recorded in the Bible. She is celebrated in the church on July 1 in the Eastern Orthodox church. Note that the Orthodox church does not have the same requirements for sainthood as you might be used to: she joins luminaries like Abraham, Joseph, and Jacob on the calendar. Also, recall that in the years before formalized bureaucratic processes, saints were not made by the Church; they arose, grassroots-style, from the people. In Esther’s case, she became very popular with a particular group of people in Spain, born from one of the worst sins the Church committed. During the Spanish Inquisition of the late 15th century, the Jews of Spain were given a life-or-death choice: convert to Christianity, flee the country, or die. For the Jews who chose conversion, such a capitulation did not reward them with an easy life thereafter: they were ridiculed and shunned by their former community, and denigrated and distrusted by their new co-religionists. The word for this group of converted Jews in Spanish among the Spanish Catholics was ‘marranos’ or ‘pigs’ which should give you an idea of how they were received. In the face of such hatred from all corners, this beleaguered group found a way to hold on to their identity in secret. Because they were not able to celebrate Purim or Passover, or any of the traditional festivals, the Jewish converts became much enamored with a Saint Esther, and threw themselves into celebrating her festival in the spring—around the same time as Purim and Passover would normally fall. St. Esther’s festival could pass as acceptable, because after all—was she not in the Christian Bible? Was she not a biblical heroine? Surely all good Catholics had heard of Saint Esther! Icons of her began to appear all around. Many of the converted Jews fled to the New World, and seemed to have taken their love of Esther with them to Mexico and the American Southwest (although there is conflicting information on this). The retablo style of iconography soon grew to include Esther, and celebrations of her feast day sprang up in the small towns of New Mexico. Esther’s story, of a woman who secretly clung to her faith in spite of all oppression, spoke to those who were experiencing the same sort of trials at the hands of the Church. Her sainthood then is both a rebuke of the Church’s sins, and a hope that people of faith may learn from her witness in the future. The Archangel Michael is not known for giving interviews, so quotes from the Archangel are rare (read: nonexistent). Quirks, however, are plentiful, particularly those associated with the many monasteries, churches, and holy sites named in honor of St. Michael. One particularly fascinating quirk is the legendary Sword of Michael, a straight line of monasteries and churches forming a spiritual path devoted to St. Michael in the form of Michael’s sword. The hilt of the Sword begins at Skellig Michael (meaning Michael’s Rock), a 6th century monastery off the coast of Ireland (or somewhere in a galaxy far, far away, if you’re a fan of the latest Star Wars movies). The Sword of St. Michael continues through Saint Michael’s Mount (Cornwall, England); Mont Saint-Michel (Normandy, France); Sacra di San Michele (Turin, Italy); Sanctuary of Monte Sant’Angelo (Mount Gargano, Italy); before coming to an end at Stella Maris Carmelite Monastery (Haifa, Israel), representing the tip of the sword. Legend holds this line symbolizes the sword that Michael used to send Lucifer and the other rebellious angels into hell. Michael’s legendary fortress, Mont Saint-Michel off the Normandy coast, may be the most famous edifice built to honor the Archangel. Mont Saint-Michel began its life in the 8th century, when legend holds that Michael appeared to Aubert, bishop of Avranches, and instructed the bishop to build a church in the Archangel’s honor. The bishop ignored the Archangel’s request until Michael burned a hole in the bishop’s skull with Michael’s angelic finger. Needless to say, the bishop began the foundations of Mont Saint-Michel immediately. Its English counterpart, located off the coast of Cornwall in a tidal area with similar characteristics, is Saint Michael’s Mount, also built in the 8th century and serving as a monastery until the early 11th century, when it passed into private ownership. No legends tell of Michael burning holes to encourage the building of this edifice, although the island’s west side was long-known as a place local fisherman would row past before going out to sea, as Michael would appear and warn of any imminent danger that awaited them. While not directly associated with Michael, the island is also known as the dwelling place of a giant who would steal cattle and children until a young man named Jack ventured to the Mount, dug a deep pit while the giant was sleeping and blew a loud horn to startle the giant awake. Raging to find the source of his disturbed sleep, the giant stormed out of his castle and fell into the deep pit, and the legend of Jack the Giant Killer was born. 159 Comments to "Esther vs. Michael the Archangel"
Don’t vote for Michael! He’s way too overpowered since he’s an angel! Had to vote for Michael because my church is St. Michael and All Angels! A fellow Saint Michaelite from Dallas! Alas I fear this is as far as Michael will make going by the current vote percentages. Love the Michael legends!! Voted for Esther. Me five! I love Esther for her bravery in saving her people. Going with Michael, Bev! Have been to all 3 Michael’s “Mounts”, am in the parish of St Michael, and Michael is my nephew’s name! I still think putting mortals against Archangels isn’t very fair. I voted for Esther. I like the old 1950s movie Esther and the King when I was a kid an d there was no cable TV. But, what about the movie with John Travolta: Michael? It’s brilliant! Change your vote! John Travolta as Michael is one of my favorite movies. It showed a human side to a powerful angel, a not very holy angel in that movie. I still voted for Esther, though. Agreed. Michael is/was an angel, not a human. Thus I voted for Esther/Hadassah. I had to vote for Michael. He is the warrior angel who commands the army of the Lord. I have a son in Military Service. He is overseas right now. I ask for intercession from Michael to our Lord for protection, safety, and emotional support for my son and the others who are with him. It is ironic that I do this, I was never raised with asking the saints for assistance. May your son and his brothers and sisters in arms arrive safely back home to their loved ones. May the saints preserve him, them, and you. How delightful that you are finding novel resources for spiritual support. I am sure Michael is with you. He stands in the presence of God, and through him, so do you and your loved ones. Peace be with you. Much as I like the Michael stuff, angels are not saints. Really. Esther for me this morning for her steadfast faith even if hidden and her courage in saving her people. I like the story that she became a guiding saint for those fleeing the Spanish Inquisition. I just can’t relate to an archangel (he’s not human after all). I’m especially bothered by an angel who would demand a church be built to honor him and burning a hole in the bishop’s skull when he refused. This hardly seems like angelic behavior. Right? The skull-burning episode sealed Esther’s win for me. Who doesn’t love a mighty angel? Yet, Esther’s role in preserving her people has always touched me deeply. I love the “grass roots” people behind her iconic stature. Esther’s story may also be legend; but it’s beautiful, moving, and timely. Corporeality also gives her an edge, in my prosaic opinion. Went with Michael. Would be a harder choice if it was Mordecai (Esther’s adviser/uncle) than Esther. It seems wrong to pit an archangel against a mere human. How can an archangel be a saint? I thought it was reserved for humanity, so Michael is disqualified and Esther gets my vote. Angels are a group unto themselves. Honored and appreciated. Saints work hard for their glory. Fans of ‘Supernatural’ should not be swayed by that depiction of Michael, who fulfills his role as messenger warrior . . . difficult matchup today mindful of Galatians (rendered in The Message) “we will not compare ourselves with each other as if one of us were better and another worse. We have far more interesting things to do with our lives. Each of us is an original.” Sticking with the original Michael…. But….that’s what Lent Madness is all about. For such a time as this . . . Esther gets my vote. We are having a bathroom remodeled and this morning as I was getting ready to read of today’s Lent Madness battle, a gentleman arrived to install the floor. He introduced himself as Michael and is THE 4th Michael to work on this small project. I took it as a sign! I would think that being a human being was a non-negotiable condition of being a saint. Don’t you? The word “saint” simply means “holy one”. That would apply to angels as well as to humans. Angels and saints are different beings. Michael the Archangel should not be in this race. This is a really tough call for me, so I’m down to this: who can prevail against Peter in the next round? I’m going with Michael. willingness to put herself at risk for her people gets my vote. I voted for Esther because she risked her life and used her wits to defeat Haman and save her people. There are far too many Hamans around today, spreading hatred. Michael and his quirks for me. Michael has some seriously entertaining legend. I voted for him, knowing he’s unlikely to win, even though I tend to be of the opinion that angels should be in their own category leaving sainthood to mortals. I live in New Mexico. In honor of some Catholic Hispanic friends who only recently learned they were descended from Jews, I vote for Esther. I was born and raised in New Mexico. As much as my inner child wants the big protecting angel to win, how can I vote for a divine being over a brave human being risking their life by “coming out” under dangerous circumstances to save the oppressed? Two women in my life that I cherished for their deep faith were named Esther so I was inclined to vote for Esther. Being paired against a non-mortal made it a clincher. My older daughter was Queen Esther in the Purim parade at her preschool, held in a Jewish community center. Had to go with Esther! I vote for Esther, a human being, whose beauty, courage, and wit, God-given traits, enabled her to bring about the saving of the lives of her people. Have to go with Esther. Her story intrigued me as a child, her bravery and ability to speak up for her people inspired me. I believe we need to emulate folks who speak up for the threatened, endangered through no fault of their own, but are simply not of the majority. Speaks courageously for our times. Personally, I am not impressed with an angel who needs or uses a sword for destruction. I object (once again) to pitting mortals against angels – but I still love Lent Madness! And, how fascinating (and tragic) about the Jews in Spain and how they found a way to remain true to their heritage. Today’s winner will go up against Peter. I don’t think Esther can beat him, but I’m going with her anyway. I loved learning about the Esther fan club among the Jews in Spain. Here is the power of the whole concept of sainthood–to encourage and inspire the suffering. No one asked if she were “real,” but real people were changed by her story–“just” a story. So I’m voting for Esther–for her witness and courage, for the power of stories, and because I’m still smarting from Michael’s defeat of Anna the Prophet! I’m with the others here who say no to angels as saints. And to me, swords are not saintly, nor fortresses, and certainly not burning holes in people’s heads! Agree. Love Lent Madness but, Michael should not be in the race. I call on him so often how can I NOT vote for him? I think the bio on St. Michael the Archangel was milk toast and geared towards giving Esther a leg up. I call BIAS! Vote for Michael, I mean. Me, too. I’m with Michael. I don’t usually gravitate towards dudes wielding swords, but hey, people have been dissing him so much that he’s now the underdog, thereby qualifying him for my vote. If I ever meet him I’m glad I will be able to say I at least voted for him once (I didn’t in the first round). And no more comlaints about his presence in this race. It’s not LM, but church tradition that’s made him a saint. There is a reason for that (I only hope it’s a good one). While the stuff about the sword of St. Michael was interesting (could a link to a map image be included? ), I don’t think it’s fair to have angels or archangels (or cherubim or seraphim for that matter) in the competition. And I love that Esther continued to inspire her people. I didn’t expect the Spanish Inquisition this morning, but had I not already decided on Esther, it would have sealed my vote! This “quirk” seems to be completely disqualifying. Supposedly, a messenger of God demanded a church to be built in his own honor, and then caused great harm to a human being who did not obey his demands. I don’t believe a word of it, but then, I also don’t believe that angels have any right to compete with human saints for the Golden Halo. I must agree, Angels aren’t ‘saints’; mortals are. In the spirit of the book of Hebrews, what guiding witness can an angel offer, who has not suffered in this world as mortals must? Esther’s story is a great encouragement to all who are persecuted, and we have too many of those these days. Sorry, the legend of Jack the Giant Killer doesn’t sway me to Michael. Voted for Esther, as I did in the first round. I also disagree with pitting angels against humans. I went with Esther, for a variety of reasons, though, not just that. I have yet to cast my ballot, but from the comments above, I presume Esther is running away with it. A good friend of mine loved Esther, it was her favorite holy day on the Jewish Calendar, so my guess is my vote goes for Esther. Michael doesn’t come off to saintly, but as an angel, I’m not in a position to question his goodness. God works through Michael in mysterious ways. An archangel who burns holes in people’s heads versus a young woman who risks her life to save her people? Hmmmmm, how will I ever decide? That’s how you get their attention. Not to mention any names, but haven’t we all known bishops who needed drastic measures to let a little sense in? Michael all the way — Michael – one who is like God. So vote for God. For her faith and courage, Esther gets my vote today. All honor to St. Michael, nevertheless, since I’m a retired thurifer, and I once heard a prayer to St. Michael said while the priest was laying on the incense. My older son was baptized in the chapel of St. Michael and All Angels in Dallas. Although he’s not specifically identified as St. Michael, an angel who is either St. Michael or so much like him that it makes no difference, appears in the comic strip “Rose is Rose.” He’s Pasquale’s normally cherubic guardian angel’s alter ego who morphs and appears, sword in hand, when Pasquale is about to do something dangerous. I didn’t know about the festivals for St. Esther becoming so (understandably) meaningful to Jewish-to-Christian converts in Spain! As for Michael, um, insisting on a church built in his own honor (and using harm to persuade) is not at all saintly, and hardly angelic. Perhaps it wasn’t Michael who appeared to the bishop. While I’m not convinced either of these two characters actually existed, I’m going for Esther because of the legacy of her story. For my Jewish friends and my grandmothers, both named Esther, I’ll go with Esther. I loved the history of the “marranos” association with Esther, who was already one of my favorite old testament figures. Therefore, Esther, once again, wins my vote! really enjoyed the story of Esther today and was especially interested in her place in New Mexican culture. Time for further research! Still a little fuzzy on how either of these eminent beings made it into a list of saints…. Michael the mighty warrior angel. So there’s no one out there who ever wanted to burn a hole in a bishop’s head – at least figuratively? I’m sure there is somewhere. As a nurse I was horrified that an angel would burn a hole in someone’s head for any reason. That seems distinctly evil to me. Esther gets my vote – as she did in the first round. Again, just gotta vote for the human. This was a tough one for me. As a retired police officer to not vote for St. Michael, the patron saint of police officers, was difficult. However, I’m sure that St. Michael is pleased by the courage and example of Esther; therefore, she gets my vote. I voted for Esther because she can be a saint; Michael, being an angel, cannot be one. Then why do we have St. Michael and St. Raphael and St. Uriel and St. Gabriel? Kudos today to both bloggers for their excellent write-ups! I found the geographic info about Michael’s sword very compelling (Dan Brown, are you reading this? need an interesting religious vehicle for your next bestseller?) but I stuck with Esther – not only because she’s one of my five remaining bracket picks for the potential Elate Eight, but because she so wisely reached out to her community to pray and fast with her as she prepared to approach the king. Think how much better our world would be if that humble approach preceded all important negotiations . . .
Tammie, I like that thought about a “humble approach preceded all important negotiations. I have always loved the Esther story, but I always vote for Michael Archangel. I voted for Esther in atonement for the horrors of the Inquisition and The Church’s terrible persecution of our Jewish compatriots. Ester is as legendary as Michael. Michael is mentioned in scripture and is my namesake ! One vote Michael! Yes, and Michael does have Saint in front of his name. To deny him this is not our prerrogative. cf Irene’s comment below. YMMV, of course, but the original, non-bureaucratic meaning of saints is “holy ones,” so I have no trouble including Michael in that category. We sing, “Ye Watchers and ye holy ones…archangels, angel choirs.” While personally I think neither Esther nor Michael “existed” in the historical or scientific sense (feel free to disagree), I don’t think that is important in this context. Esther’s write-up today was superb, but I had to vote for Michael out of loyalty and gratitude: I chose him as a patron saint during a particularly difficult time of my life. Love hearing the Michael legends, but I had to cast my vote for Esther. Her unwavering faith and her work should be inspiration to us all in how we should live. Nothing against Michael, love Michael, but I just think Archangels shouldn’t be competing. Esther: her story is my favorite book in the Bible. I will remember her on July 1! Obviously, she got my vote. Esther would make a fitting wearer of The Golden Halo. Looks like Michael’s getting stomped, but I have to remain faithful to him because the first church I worked at was St Michael & All Angels–not the Archangel but the Prince of the armies of heaven, I guess. More remotely, Britten’s War Requiem, one of my favorite works, was written for the dedication of the new Coventry Cathedral of St Michael the Archangel. After yesterday’s match up, I find this pairing a little underwhelming. Burning holes in people’s heads when they won’t do what you want doesn’t really fit the category of saint. I vote for Esther in honour of all those whose faith is known only to God, and for those who found in her a solace. “Her sainthood then is both a rebuke of the Church’s sins, and a hope that people of faith may learn from her witness in the future.” This from Megan helped me stay on Team Esther this round. Wow. Let’s hear it for the two bloggers today. My vote is for Megan and Laurie. Each writer gave it her all, although I have to say that including Jack the Giant Killer smacked a bit of desperation. I voted for Esther, because I was convinced by the historical recounting of the expulsion of the Jews from Spain in the Alhambra decree of 1492 (a highly ambiguous year in western history). Jews, Moors, the “Other,” all have been ejected from our civic bodies. Never forget, but what terrible things to remember. I voted for Esther, because today, this very “day” in political history, we are seeing the term “globalist” used more and more, and in the mouths of adherents of a certain political party, it invariably means “Jew.” The rise of anti-semitism and the far right in American political culture is an alarming fact of current news. Racist dog whistles of “14!” and “globalist” pierce our degraded political discourse. We are traversing difficult shoals, and the vision of the beloved community is threatened. So I vote for Esther as a sign of solidarity with besieged communities and those vulnerable people being deported in acts of cruelty by an intolerant political order temporarily in ascendance. Resist. Michael – because of my love of Coventry Cathedral: St. Michael and all Archangels, a very thin space. So perhaps there’s an “Advent Cup” in our future, where angels and other spiritual entities battle it out on the road to Bethlehem??? Oh I could go for that! Let us petition and plead and if needed, grovel and bribe. I understand the SEC can be had for a price. If that is to happen, I nominate the angel forever associated with the Annunciation: Gabriel. Sometimes you gotta do what you gotta do. . . and as much as I love Michael, Esther speaks more to my soul and spirit! She did what she gotta did! Sorry, Michael, but it’s Esther all the way. In addition to her brave act of breaking protocol in order to have an audience with her “husband,” a paranoid tyrant who thought death was the appropriate response if someone disobeyed his will to the smallest degree and her truth-telling to save her people at the dinner party, she had had to live a secret life among her fellow “wives,” undoubtedly needing to endure slurs against her fellow Jews over and over and over again. Courageous, resourceful, patient, and humble. It’s Esther without question in my mind (not always the case with some other play offs). I am too much of a realist to be more than just charmed by the fantastic stories of angels anyway. Esther had chutzpah and in a male-dominated world she used her wiles to protect her people (or at least give them a chance). I had to vote for Esther. I work at a Jewish Community Center & we just finished celebrating Purim – a fun, raucous event complete with preschool kids parading the halls in costumes, noisemakers & best of all – Hamantashen cookies! The non-derogatory name for the Jews who converted during the Inquisition is “conversos,” btw. Thanks for all the terrific info about their celebration of St. Esther! I had known of the Spanish Inquisition, but your added details touched me deeply. Esther bravely defended her people. But the to know how she gave strength to those who followed is great! I love Mont Saint-Michel, but my vote goes to Esther- she persisted. I voted for Esther in honor of the”Marranos”. Sometimes you have to make do, and I am sure St Esther was right there with them. The underground Purim, Jesus would love it!! (But not the way the Spanish treated his dear children). Esther, more believable vs Michael of legend and story. I chose Esther as a more worldly person who acted out of faith. Tough choice, as always. St. Michael is dear to me, not least because of Henry Adams’s “Mont-St.-Michel and Chartres,” one of the great accounts of medieval Christian faith, and my own visit to that monastery, which took place decades ago on a day when I had the place almost to myself (November was not then a month for tourists to visit there. More recently the St. Michael of Cornwall has been of interest to me, again partly for literary reasons (he’s mentioned in John Milton’s *Lycidas,* an elegy famous for supplying Thomas Wolfe’s autobiographical novel *Look Homeward, Angel*). Plus angels aren’t taken seriously enough these days despite their frequent manifestations among us, especially in church as we begin the Great Thanksgiving (“therefore with angels and archangels and all the company of Heaven”). To put it another way for *Star Wars* fans, the Great Thanksgiving is a moment when we feel “a great disturbance in the Force* as Heaven draws nigh to Earth. However, having said all that, my experience of the sacred at Chimayó and generally throughout northern New Mexico with the Marranos (there’s a high concentration of the in NM because it was the furthest they could get from the Spanish Inquisition, so remnants of their crypto-Judaic practices abound there), and because in these times the persecution of religious minorities is a world-wide shame–I voted for Judith. Also, the Orthodox interpretation of the saints are, together with the assignment of feast days to them, is much to be preferred to the Latin restrictions on sainthood. Fun story. We frequently have Easter dinner with a Jewish family. It’s specially fun when Easter and Passover overlap. Our daughter was 5 or 6 at the time, and in the pantry with our hostess (Jewish family) My daughter emerges with a cloth over her head like a hood. I asked her who she pretended to be, she said “Esther.” Our hostess had told her the story of Esther while assembling dinner. I was very proud of my daughter’s imagination and desire to imitate a heroine. That story will stick with me forever. Esther for the win! Sorry kids, that write up about Esther was a snooze. I’m all in for Michael, against insurmountable odds at this point, apparently. He’s already seen the face of God, so the golden halo is rather superfluous, especially since he has wings! The 7000 pairs of shoes on the Capitol lawn yesterday have determined my vote today. Alleluia in Lent? I’ll allow it. Sorry, Michael, it wouldn’t matter who was up against Esther, she’ll always have my vote (fav. book in the Bible!!). I have loved the story of Esther since I was a child. She was brave and true to her people and she did something few would do. So a legend says that Michael burned a hole in a bishops head to get his attention and that has garnered all sorts of hand wringing and complaints about cruelty. Turning a woman into a pillar of salt because she looked back at her town is seen as kindness? How about tying fox tails together and setting the animals on fire — good behavior? Fox tails? You lost me there. Good grief, how did I miss that one these 50-some years??? From childhood onward, I’ve admired, respected, and loved Esther for her bravery and her commitment to her God. Still loved Michael dancing to “Chain of fools” (Chain, chain, chain”), but going with Esther. Hey, she saved people; gotta count for something. Esther for her courage in saving her people and becoming a saint for the Jews fleeing the Spanish Inquisition. I voted for Esther because one of my friends in college was descended from the Sephardic Jews who fled Spain to New Mexico. And I don’t approve of the Inquisition. Also there is a very nice lady at our church names Esther.